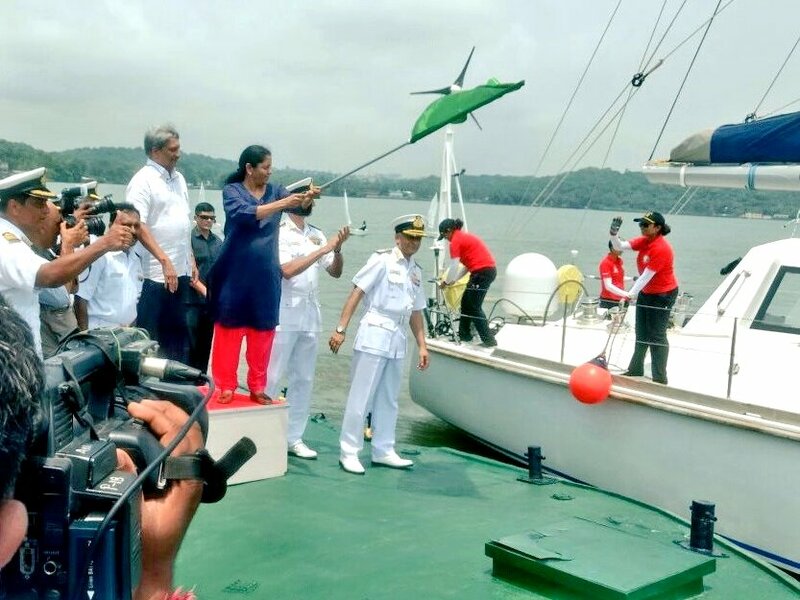 The Minister of Defence, Nirmala Sitharaman on Sunday flagged-off all-women crew of Navika Sagar Parikrama at the INS Mandovi naval training base near Panaji in Goa. This is the first-ever Indian circumnavigation of the globe by an all-women crew and shall attempt to circumnavigate the globe on Indian Navy’s sailing vessel INSV Tarini. The crew is expected to return to Goa in April 2018. The event was attended by Goa Chief Minister Manohar Parrikar, Admiral Sunil Lanba, the Chief of the Naval Staff, other senior naval officials as well as civilian dignitaries including family members of the crew. The Chief of the Naval Staff, Admiral Sunil Lanba said that the present circumnavigation by an all women crew is an extension of the above efforts and reflection of the Government’s efforts at Women Empowerment – “Nari Shakti”.